Ghosn: "Lots of mergers collapse and destroy value -- the strength of any company is the ability to motivate people, and how how are you going to do that if some of these people consider themselves second-class citizens." PARIS -- Carlos Ghosn tamped down expectations of a quick deal to combine Nissan and Renault, saying the specter of failed mergers in his industry loomed large. "I don't think you're going to see it this year or next," Ghosn, chairman of the Renault-Nissan-Mitsubishi alliance said Wednesday. "Lots of mergers collapse and destroy value -- the strength of any company is the ability to motivate people, and how how are you going to do that if some of these people consider themselves second-class citizens." Renault and Nissan are discussing ways to strengthen their lopsided two-decade old alliance, including a possible merger, as the industry shifts to meet new challenges in an era of self-driving and electric vehicles. The talks are delicate, with Nissan seeking to gain more influence in crucial operations such as product development, Bloomberg reported this month. The companies are also mapping out the future of the tie-up, requiring constant globetrotting among top staff, before a new generation of management takes over. While Ghosn and Nissan's CEO Hiroto Saikawa, both 64, are keen come to an agreement before they retire, the new structure may not be in place before they leave. Ghosn is aiming for a combination that would help pool resources at a time of record outlays for new technology and to face down new competitors like Uber. Coming to an agreement looks a tough battle. Saikawa has publicly downplayed the need to merge while saying he wants to keep the alliance intact. A decision on the alliance may be made within a year, he said this month. 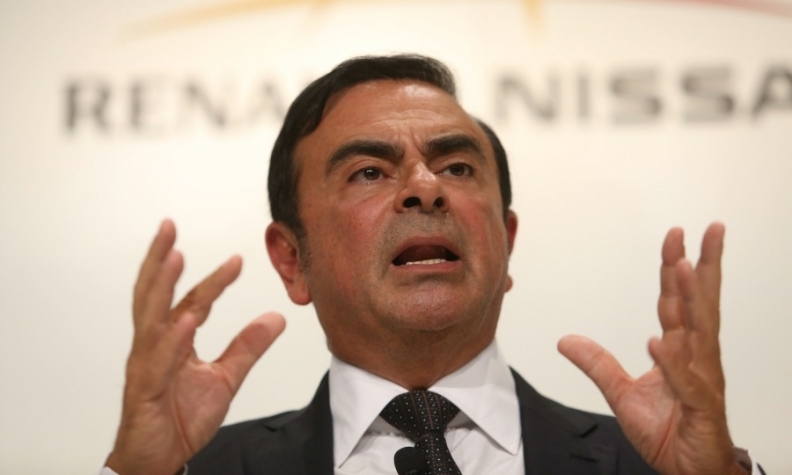 Ghosn has said the Renault-Nissan-Mitsubishi alliance is looking at several options, including a merger, to help deepen the tie-up into something "irreversible." "I don't think there is a resistance," Ghosn said during a discussion at Bloomberg's Sooner Than You Think technology summit in Paris. "Let's try and find something that will reassure the stakeholders that this will continue, but at the same time maintain identity." The partnership has a byzantine structure that can be confusing for investors. Nissan holds a 15 percent stake of Renault and no voting rights. Renault, with smaller returns and less valuable than Nissan, has 44 percent of Nissan and can vote on corporate matters. In 2016, Ghosn added Mitsubishi Motors to the mix after the company had been caught falsifying mileage estimates for several of its vehicles. Further complicating matters, the French government owns 15 percent of Renault, making it the largest shareholder.